We’ve also spent some time discussing the bat with it’s manufacturers and reading everything the internet has to offer on the bat this early in the game. On the whole, this new balanced hybrid was preferred by hitters who appreciate the ring of aluminum at contact, want a slightly mor… Jump to the full review. We aren’t the only ones to have information about the CAT 7 Connect. Other places, in particular those who sell bats, usually have a boiler plate write up on the specs of a bat. Many of those we reference to make sure we are seeing what we should be. Here are some more references for the 2017 Marucci CAT 7 Connect review. We’ve also spent some time discussing the bat with it’s manufacturers and reading everything the internet has to offer on the bat this early in the game. On the whole, this new balanced hybrid was preferred by hitters who appreciate the ring of aluminum at contact, want a slightly more end loaded bat (when compared to the 2016 CAT 7) and prefer the forgiveness of hand ring found in a composite barrel. We can confirm Marucci’s claim about a larger sweet spot when compared to the 2015 CAT 6. We have no doubt the 2017 CAT 7 Connect is a performance bat made by a very legit company that specializes in baseball gear made to impress those at the highest level of baseball. Marucci is, after all, owned by major league ball players. As such, we wouldn’t hesitate recommending the 2017 BBCOR CAT 7 to the player who: Prefers end loaded bats; wants a bat with no break in time; doesn’t buy the over-sized barrel theory; looks for value buy; wants a beautiful bat. Mid to heavy swing weight hybrid bats, like the CAT 7 Connect, have some serious competition. 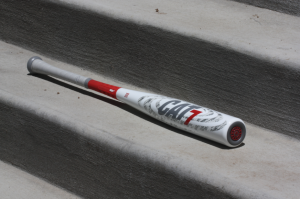 The 716 Select from Louisville Slugger is what we would consider the CAT 7 Connect’s most serious competitor. Both are stiff transition hybrids with good durability and a considerable sweet spot. The 716, as we write elsewhere, is as well received a hybrid as the bat world has ever seen. From a design perspective, the Mizuno NightHawk is quite similar in it’s two piece hybrid design with variable wall thickness to expand the sweet spot. Swing weights are also similar. Other mid to heavy swinging performance hybrid bats that are worth a look are the DeMarini Voodoo Raw, the Easton Z-Core Hybrid XL and, although a bit off the beaten path, the 2016 Axe Elite. What is a Hybrid Bat? A hybrid bat in baseball, you should recall, is a two piece design where the handle is made of composite and the barrel is made of an aluminum alloy. This general design feature allows for two specific benefits when compared to other designs. (1) Aluminum is never any hotter than when it’s directly out of the wrapper. A hybrid bat gives a hot out of the wrapper experience due to its aluminum barrel, but still delivers the sting dampening and smooth feel a composite handle provides. (2) The transition between the aluminum and composite give manufacturers an opportunity to remove the vibration created on barrel mishits to transfer to the handle. This provides for smoother feeling swings and better hitting experiences. The CAT 7 Connect is a hybrid bat. The aluminum barrel is massively upgraded from the 2016 CAT 6’s barrel and is thinned internally as it expands away from the center. This tapering creates a greater trampoline effect away from the barrel’s center which, in turn, makes a longer sweet spot. Other bat companies (like the Rawlings VELO and Mizuno NightHawk) have used this technique before with very good reviews. The composite handle is riveted into the Connects barrel through a threading process. The insert, at least as claimed by Marucci, helps dampen sting and keep the vibration on mishits in the barrel instead of your hands. Our experience appeared to confirm this. The CAT 7 Connect will only release in a BBCOR bat for 2017. In large measure, due to the heavier nature of the swing weight (it comes in around 15% heavier than the CAT 7), the Connect only makes sense in the BBCOR space. Those looking for a senior league, big barrel or lighter swinging bat within the Marucci brand should, as we discuss elsewhere, check Marucci’s other bats this year.